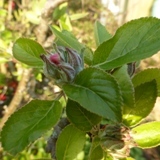 Looking back to 2016: click on Journal for 6th May and Journal for 13th May to view last year's later blossom period. 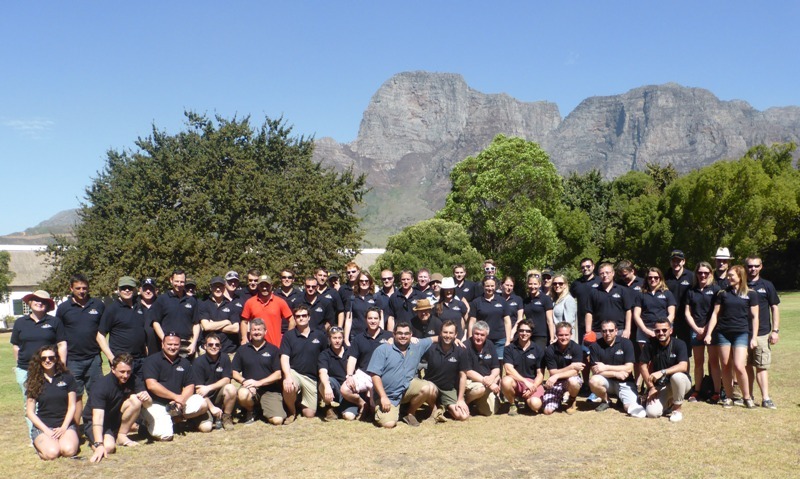 On the fourth day of the Under 40's Conference, the delegates followed their visit to Du Toit (featured in last week's Journal) with a very memorable visit to the Boschendal Wine Estate. 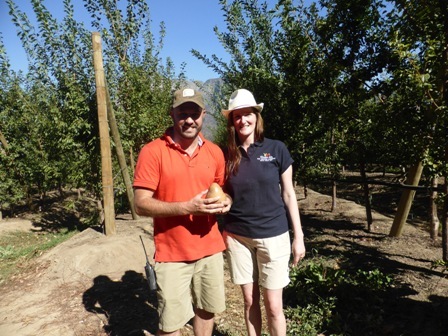 Agriculture and a simple farm lifestyle is at the heart of Boschendal. One of the oldest farms in South Africa, founded 1685, the farm has grown with the passing centuries into a cherished source of wholesome produce, great wines and happy memories. 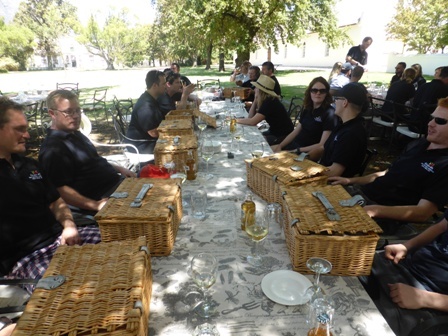 Boschendal has long been famous for its generous picnic baskets enjoyed on the spacious estate lawns, and during the warm summer months the estate gardens provide the perfect setting for a picnic lunch in the shadow of the Simonsberg. 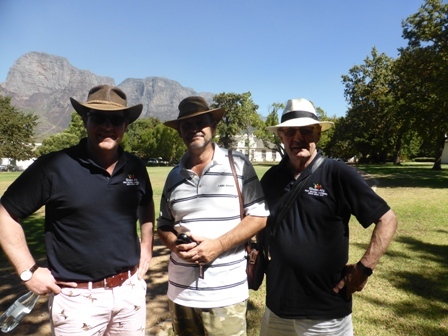 Beneath the trees, the U40 delegates enjoyed a fabulous picnic lunch with Altus Prins and Dirkie de Vries from Direct Produce Supply (DPS) who have been an invaluable contact for Charlie and the U40 Committee in planning this memorable 50th anniversary Under 40's Conference. 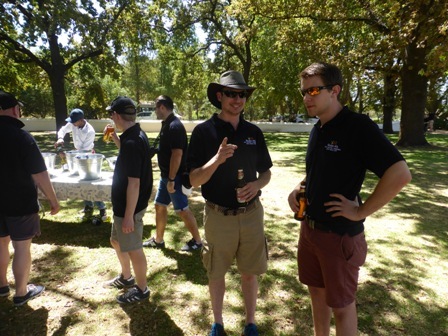 Altus heads up the DPS team of 3 in South Africa, a role he has fulfilled now for 18 years. 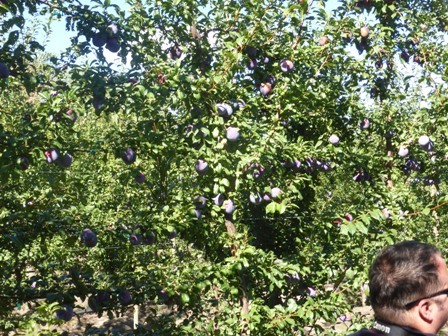 DPS supply Tesco with 100% of their Organic Persimmon....DPS work with 140 stone fruit growers and 65 stone fruit packhouses via 10 exporters. 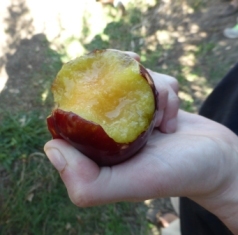 SA Stone fruit is the core business including Cherry, Organic Citrus & Persimmon. 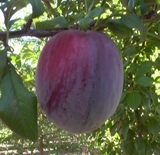 DPS is currently the biggest importer of SA Stone fruit into the UK and still growing! 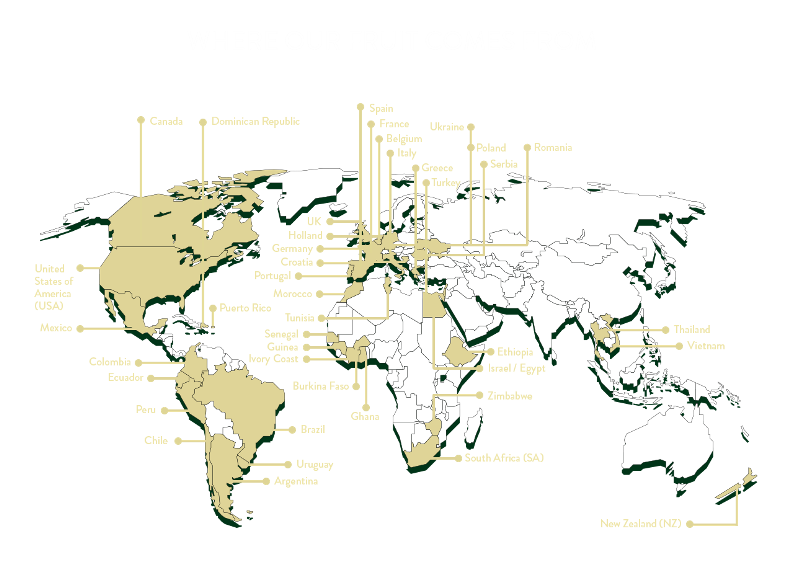 Globally DPS operates in 40 countries and employs 55 people worldwide sourcing: - Stone fruit - Chestnuts - Kiwi - Berries - Organic Citrus - Exotic fruit. "My business philosophy is: Work with faces not companies. Faces, which gives you commitment; loyalty and a solid relationship based on honesty & trust. It takes years to build this, but if you accomplish that; it is forever. Nobody can take this away from you; no matter how hard they try! 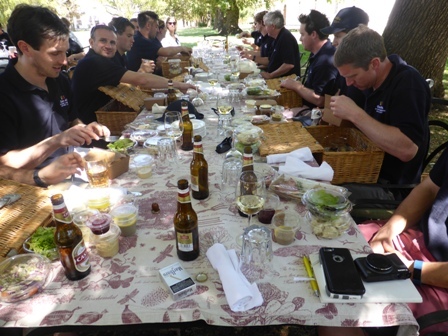 Following our lunch Jacques du Toit who joined Boschendal 4 years ago explained the farming philosophy operating at Boschendal. 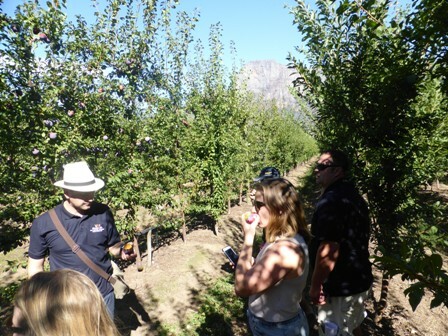 Jacques has been steadily changing the management strategy to a Biological and Organic mindset with the full support of the Boschendal Board; Jacques gave the U40 delegates a detailed overview of how the Estate is extending the fruit growing enterprise. Jacques said it all began with an examination of the organic status of the soil. With the 2 metre deep lovely (looking) dark soil giving an impression that all was well; to gain an independent perspective Jacques sent soil samples to Brookside Laboratories Incorporated in Ohio USA. the resulting analysis gave a rating of 2. 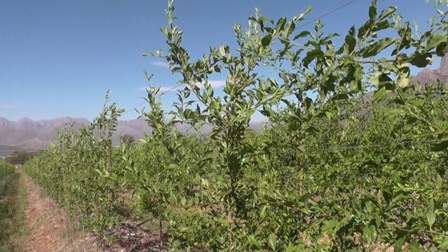 Jacques was initially not sure how this rating compared to virgin soil (un-farmed) so he took samples from mountain areas where Proteas grew naturally and where no farming activity had taken place; this virgin soil came back with a rating of 23; Jacques said; "time to focus on the soil"
After 6 months of adding organic matter to the soil, increasing the bacteria and biologicals, he re-tested the soil and recorded an improvement of at least 400% - with ratings between 8-16! The drive to restore soil humus is critical to performance; water usage has dropped by 30% due to the improved soil capacity to retain moisture. Jacques uses probes to measure each 10cm soil band at hourly intervals to monitor exactly what 'water' the tree really needs. 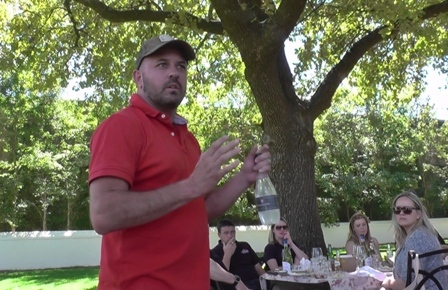 Jacques explained the Boschendal Estate is 40% dependent on 'hospitality' and 60% dependent on 'farming and growing' - when he arrived 4 years ago Boschendal had 2 restaurants and 200 cattle and only 50 hectares dedicated to fruit growing. 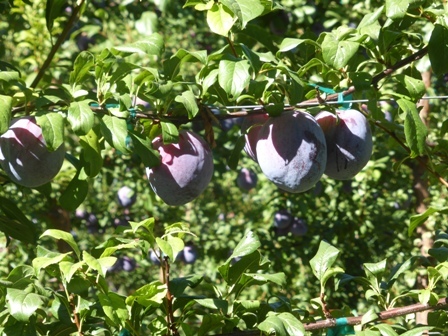 Jacques has overseen an increase to 200 hectares of fruit, with plans in motion to increase to 300 hectares. 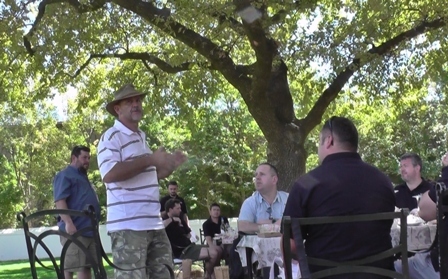 There are now 800 cattle farmed 'in a free range' environment and the Boschendal Estate now has 4 successful restaurants. The estate extends to 2,000 hectares and in addition to changing the farming focus towards biological and organic production, a further 500 hectares of land is being restored to a 'natural habitat' with game and indigenous wildlife, back to how it would have been 100 years ago. While Jacques champions the quality of his staff and the importance of utilising the new varietals, he emphasized 'none of those' will work without looking after the soil! 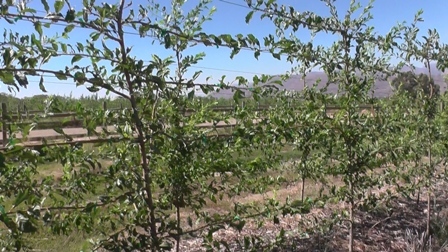 After lunch the delegates visited a new plum orchard; planted in August 2016 on a twin row trellis system. 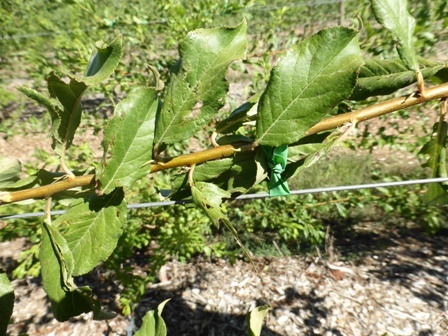 Jacque believes it is possible to 'break even' in year 2 with this system using new varieties from America. 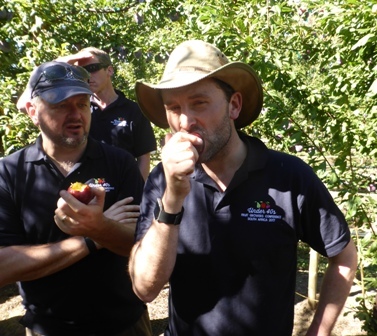 His whole philosophy is driven by planting the latest new varieties with large fruit in intensive tree systems in (of course) top quality soil. 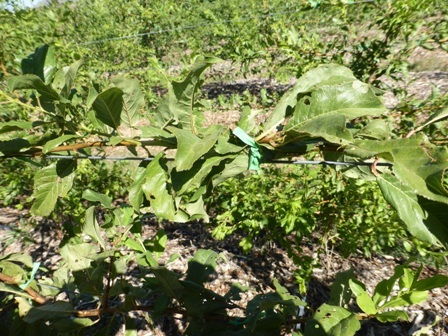 In fact Jacques said 80% of the new American bred varieties are exclusive to Boschendal in South Africa. 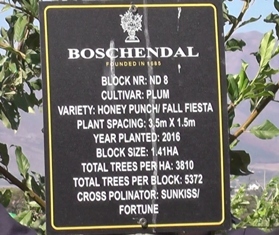 The new plantings are 'twin trellis' rows with trees spaced 1.5 metres apart and rows at 3.5 metres planted in August 2016 with Honey Punch/Fall Fiesta at 3810 trees per hectare and pollinated by Sunkiss/Fortune. 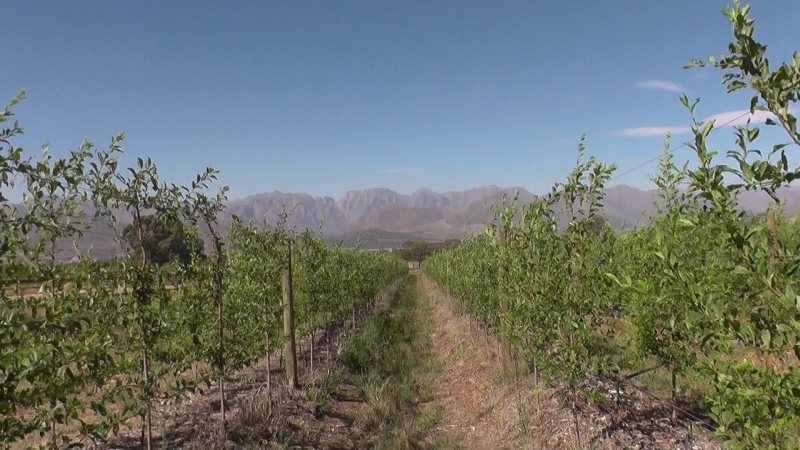 Jacques anticipates 15 - 20 tonnes per hectare in year 2 and forecasts 60 - 70 tonnes per hectare when fully cropping; the yields driven by fruit size of 45-50 mm and intensive planting. 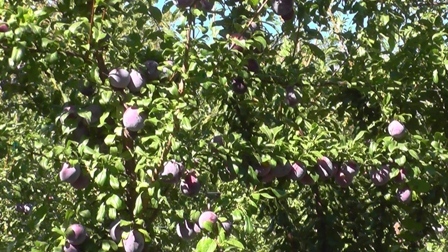 This compares with traditional (South African) plum crops of 45-50 tonnes.